犬神家の一族 ~愛のバラード~ (Side-A) Sunaga t experience 0:05'57"
Scenes In The City / Charles Mingus V.A. (BETHLEHEMの夜ジャズ Compiled by Tatsuo Sunaga) 0:10'28"
LOVE FOR SALE Nada Jovic & Dusko Gojkovic Quintet 0:20'59"
Gong Rock / Kai Winding And J.J. Johnson 須永辰緒 0:24'05"
クバーノ・チャント The Australian Jazz Quintet 0:27'29"
Comes Love / Joe Derise 須永辰緒 0:32'06"
OUT OF THE WEAK WILL COME STRENGTH 金原千恵子 0:33'59"
A LOT OF LIVIN' TO DO Nada Jovic & Dusko Gojkovic Quintet 0:40'08"
So What / Frank Minion V.A. (BETHLEHEMの夜ジャズ Compiled by Tatsuo Sunaga) 0:43'22"
Dusty Blue / Howard McGhee V.A. 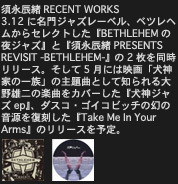 (BETHLEHEMの夜ジャズ Compiled by Tatsuo Sunaga) 0:47'42"
Hugette Waltz / Sue & Ralph Sharon 須永辰緒 0:50'34"
Pick Yourself Up / The Pat Moran Quartet 須永辰緒 0:52'43"